Open-cuff lightweight pants made from a soft cotton-rayon blend. 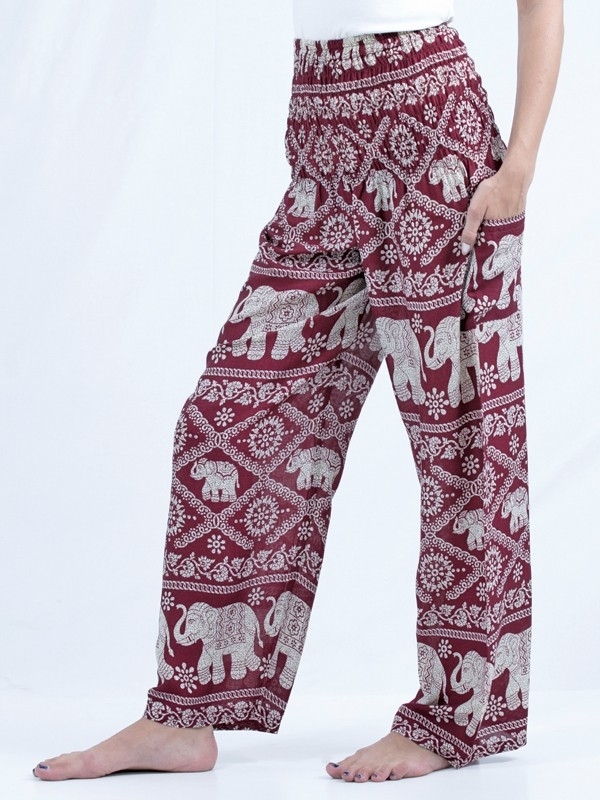 The elephant pattern details will vary depending on color. A graduated elastic waist and side pocket help make them stylish, roomy and comfortable. Available in both Standard and Generous sizes. The Standard size fits as follows: Waist size up to 32". Fits sizes 2-12. The Generous size fits as follows: Waist size up to 44". Fits sizes 14-22. 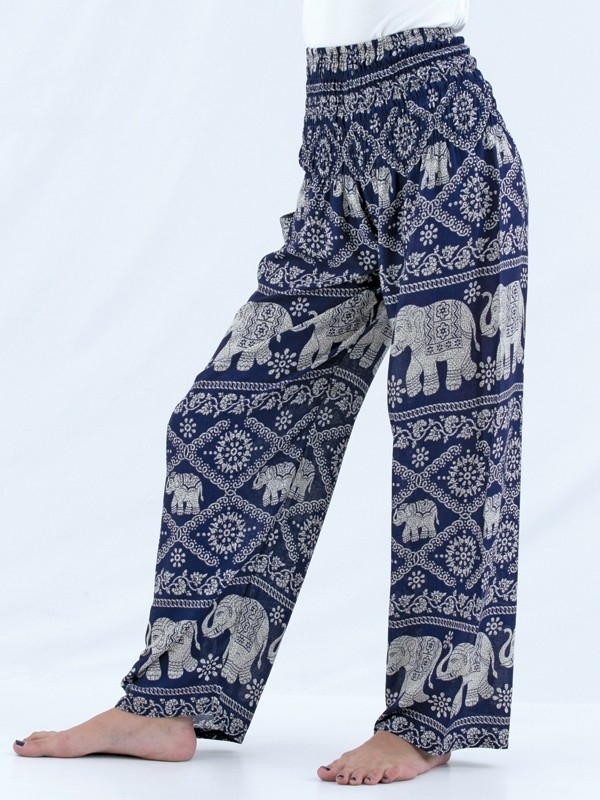 Size : Length 43" Inseam 31" Waist up to 32"
I love this elephant print fabric! Comfortable and fun to wear. Pants are attractive, comfortable and reasonably priced. Pretty, comfortable, easy to wear. I ordered the standard size, and they were a bit too small. They will make a fabulous birthday gift for my niece, though. I'm going to try the generous size, and take them in if they're too large. 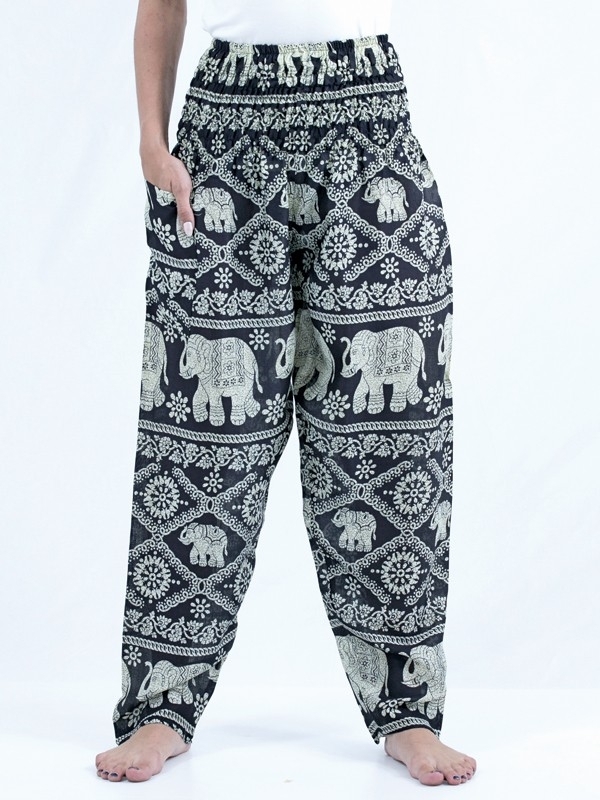 These are the most comfy summer pants! Love these pants! Very comfortable. Can be worn as pjs or with a t-shirt to run a quit errand around town. These were a gift for my Mom, who has a passion for anything elephant. She is tickled pink with them, and they really are a nice quality pants. Look very pretty on her. Great pants; unusual, comfy looking but very attractive. These pants are great: comfy, attractive to look at, and appropriate for many different occasions. All three colors are pretty. The black seemed most elegant. Was very pleased with the quality of the pants. I have bought this product before but I never purchased the unbanded ankles before. To my surprise I liked these better. These pants are perfect for No. California weather. This was a gift for my wife's birthday. She is ecstatic with the design and loved the loose fit!! We are very happy with this product. Ordered for a daughter for upcoming trip to Cambodia. She loves them and thinks they will be perfect for the weather and the temples.